≡ Sonnenberg is a British folk-type of band around the singer/songwriter Zinney, multi-instrumentalist /songwriter Dave Thom and percussionist/tabla-ist Saul Hughes. After the release of their debut album Fishing in the Pool (probe plus 60, 2007) the band performed in different formations (2-4-6 piece) in small venues as well as “the Shepherds Bush Theatre” in London and the “Boardwalk” in Sheffield. 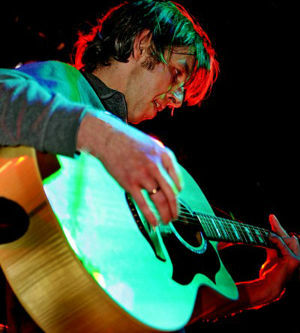 ¶ In 1998 the German Singer / Songwriter Gerd Zinsmeister moved to the English west coast. ¶ After finishing his studies at the Liverpool Institute of Performing Arts, he spent three years recording at home and in 2005 started working with Liverpools oldest Indie Label Probe Plus Records. ¶ With his band Sonnenberg, Zinney as he became known, recorded the debut album Fishing In The Pool, and has been touring as a solo artist as well as with his band. ¶ Currently he is recording his second Sonnenberg album. ¶ The lead vocal has a beauty and plaintiveness, which is very rare. The music has a fragile timelessness that soars to the point of excitement. ≡ The band’s line-up’s been reconfigured a little over the past three years. Primary singer/ songwriter Zinney remains centre stage, but he’s now joined full-time by gifted multi-instrumentalist Dave Thom (Calvin Party, Gone to Earth) and tabla player/ percussionist Saul Hughes. On record, at least, this core group is augmented by drummers Paul Sykes and/or Rob Morris as well as a few additional flavours including electric piano and backing vocals. ≡ Regardless of any re-jigging, however, ‘The End of the Rain’ is a satisfying listen from stem to stern. In tune with folk, pop and entirely capable of throwing a few startling curve balls, it (again) gently seeps into your heart and makes itself very comfortable indeed. ≡ The opening title track gives you some idea of what to expect. Plaintive and infectious, with jaunty accordions and duelling acoustic guitars weaving in and out of a melody to die for, it recalls early Fairport Convention and gets you onside straight away. Zinney’s voice has a pleasingly vulnerable quality and it’s the ideal vehicle for the heartfelt likes of ‘Save Me’, the brittle and scarred ‘Cold Ashes’ (featuring a gorgeous, finger-picked guitar solo from Dave Thom) and ‘Warm Bath,’ which sounds every bit as soothing and restorative as the title suggests. ≡ Elsewhere, the autumnal ‘Forever’ (“nothing would ever come between us...we vowed our love would never die”) and the beautifully sparse ‘The Road Ahead’ (“before you kiss me goodbye, hold on to me for a little while”) yearn for simpler times, while the hypnotically moody ‘Asylum’ shifts restlessly from pensive verse to anthemic chorus. Nothing ‘rocks’ as such, though the restless ‘Another Ship’ is adorned by some majestic lead guitar from Thom and ‘Mazes of Meaning’ pivots around a lithe, jazzy groove. ¶ It is an album that gives you value for your listening time: the songs are generous both in musical content and in length and give a variety of mood and counterpoint. ¶ And I did appreciate the crisp endings of the songs. ¶ The second track: asylum provides a mournful contrast to the jaunty folkie atmosphere of the previous number. A more sombre tone is set by the cello. The song has a minor feel and there is a tender poignancy in the voice and further contrasts between the quieter parts in the verses and the more climatic elements in the chorus. ¶ The juxtaposition of Tracks 5 and 6 also creates a strong musical contrast: another ship has moody electric guitar work creating some haunting emotion and then the crashing of the cymbals forms a sea swell. If you want to create do a slow guitar solo and this is what happens here for “a distant dot on the horizon” which “disappears for ever more”. Save me, on the other hand, has a quieter mood and the space has shrunk to the intimacy In the voice. ¶ sweet life, at nearly six minutes, is the longest track on the album. It starts rhythmically with the tabla achieving a twangy Indian sound and instruments: guitar, violin,electronics, vocals … are added in to create textural depth. What with the mesmerising rhythms and the electronic droning it’s very hippie and psychedelic and follows on well from the previous song cold ashes which has echoes of the later Beatles music. sweet life grants itself the right to meander through the possibilities of sound: modifying, distorting, contrasting, creating crescendos, fading, amplifying … The counterpoint of the instruments and vocals near the end is interesting and climatic but the music plays with our expectations, like life does, and just when you think it will fade and finish it weaves back in and the caravan twists on like those saffron–robed monks who used to dance through city streets. It’s he only track that has a fade-out ending. 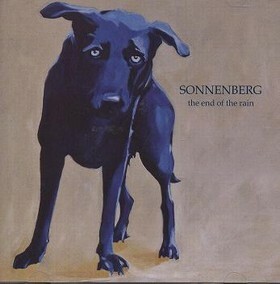 ¶ From the first note of Sonnenberg’s the end of the rain album one is struck by the clarity of the vocals so it is interesting to find the vocal experiments in tracks such as maces of meaning where the instruments appear almost to dominate and he maya which presents jangly mandolin movement. Here the vocals are indistinct behind the strident backing – how important the bass is on this track – and at variance with it, until vocal freedom is asserted. After all the restless lingering of the previous track, the road ahead, this one’s on the move with the cymbal-swish of excitement and – one presumes – an intentionally threatening amount of sound underpinned by a loud, steady drum beat. “Something is pushing me on” say the lyrics. Certainly is. ¶ Taken as a whole, the album addresses the sometimes nostalgic attachment we have to the past, co-exist with the desire to move on; the instinct to have the asylum of emotional security in the arms of a lover and the compulsion to disappear over the horizon. It is the tension of the shoreline where the traveller lingers before the sea swell claims him as a passenger to who knows where. These themes are reflected in the very effective CD cover showing a dog – by Elke Zinsmeister – and a sky – by Zoe Zinsmeister. ¶ A dog is tethered by its animal needs, its routines, its attachments. It is a social animal, a pack animal, and the same can be said to a great extent for human beings. ¶ But human beings have more choices, more opportunities to respond to the feel and sound of river and sea, the beckoning horizon, the watery winds. They can see the magnitude of he sky and dance there. ¶ The album ends with an alternative version of the first track. Not radically so. end of the (t)rain – home made version has birdsong, which has its own evocative power and provides another vocal dimension, a bit of cello and a train going by, then the guitar playing quietly. The pun in the title is apt because of the journey theme and because there is the sound of a train on the track. We are back to the strong, clear lyrics and the jaunty optimism of the resurrection song. But we haven’t gone back; you can’t go back; the song has subtly changed.